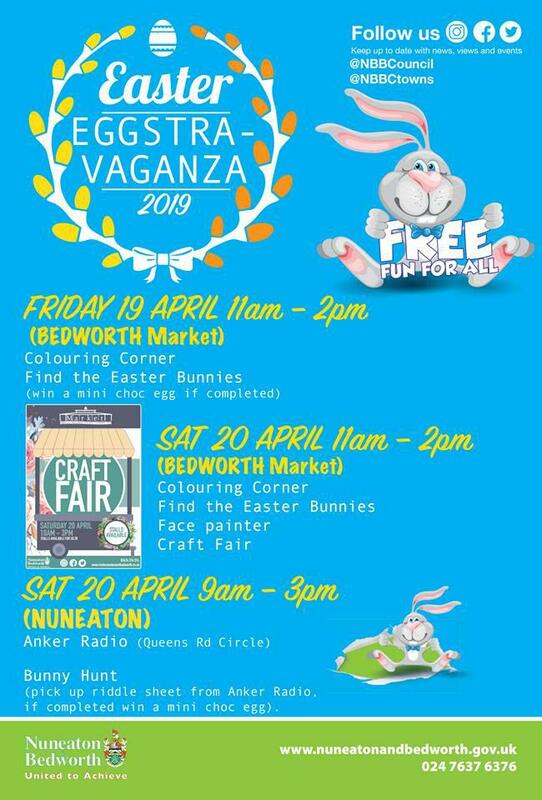 There's something for everyone this Easter in Nuneaton & Bedworth! Easter entertainment starts on Good Friday 19 April in Bedworth. Head to the indoor market between 11am and 2pm for a fun children’s Easter bunny competition and spring-time colouring. On Easter Saturday 20 April it’s time to get crafty – Bedworth Indoor Market will be full of special craft stalls offering everything from toys to candles. There will be free face painting for the little ones, along with more colouring and another chance to enter the Easter bunny competition. Meanwhile on the same day in Nuneaton, there will be an Easter Bunny hunt, with a trail taking hunters to various shops and cafes around town. Head to the Anker Radio bus on Queen’s Road to pick up a competition form and take part. “There’s something for everyone this Easter in our towns. The entertainment is free and sure to be popular with families.